We usually ship in the same business day for all orders received before 3 PM Eastern Time. Every product is tested before being shipped to ensure its quality and condition. Every order is insured so please do not accept any opened box or damaged item, make sure you inspect all items and part upon arriving to your location. If you found any damaged items please contact us immediately. We are not responsible for any extra shipping costs if your address was incorrect, undeliverable or missing an apartment number. UPS has been and still our main standard shipping method within the United States. Shipping prices are calculated and updated according to UPS rates by weight and location in real time before submitting an order. 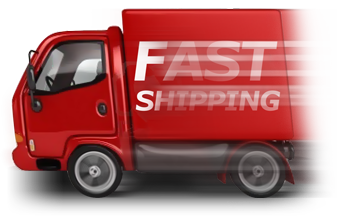 We also offer faster methods such as UPS 3 days select, UPS 2nd Day Air, and UPS Next Day Air, you'll be able to choose the desired shipping method before submitting any order.